Hi all! I’m Melissa from A Prudent Life, where I’m normally writing all about organizing and decorating our home. 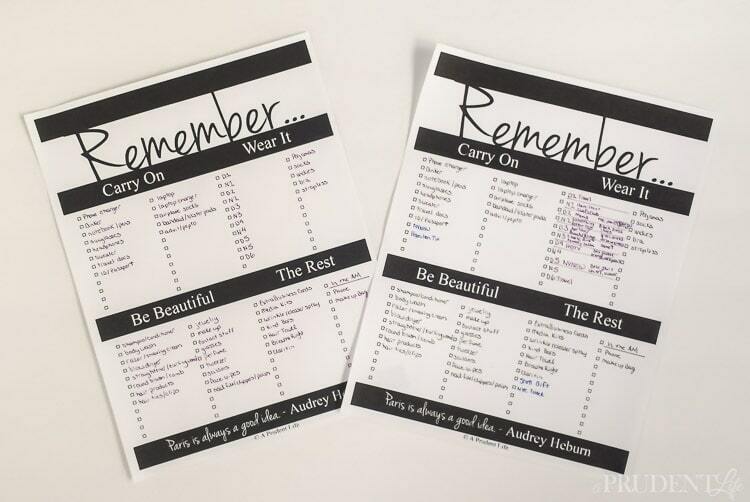 When Kim asked if I’d want to join her A to Z Packing Tips series, I knew it was the perfect chance to complete a long-lingering item on my to do list. 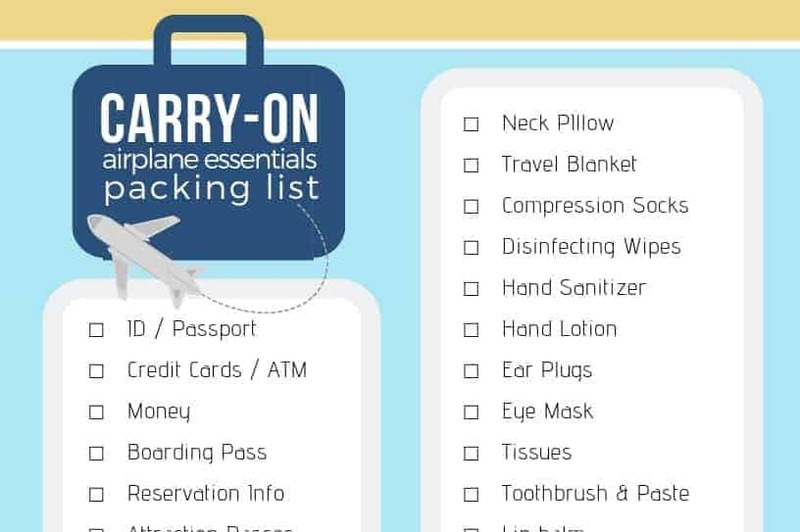 Creating a MASTER packing list! Each time I go on a trip, I make a list on a blank piece of paper. To make sure I don’t forget anything, I even divide my paper up into sections – like items for the carry-on and clothes. But, I find that each trip, the list is largely the same. And each trip, I’m still worried about forgetting something. Instead of starting the list from scratch with the potential for missing things, I wanted one master list as a base. Since everyone has a unique list of needs, I created a blank template so I could share it will all of you. To implement my list for the first time, I printed out the blank version, and added everything I could think of. Then, I made a few copies to keep on hand. When it was time to pack for a trip to New York City, I took the copied version and added in items particular to this trip. Adding things like our show tickets, specific clothing, and a gift for a friend REALLY helps reduce my pre-trip stress. I started my list about a week in advance. Each time I had a passing thought of something I needed to take, I could jot it down and then forget about it. At least until it’s time to pack! In the image below, my master list is on the left and my list for this trip is on the right. One other tip that has REALLY helped me get to my destination without missing anything is designating a “In the AM” column. You know – all that stuff like phone chargers and toothbrushes that you can’t pack up the night before because you are still using them. It’s the last thing I check before leaving the house. 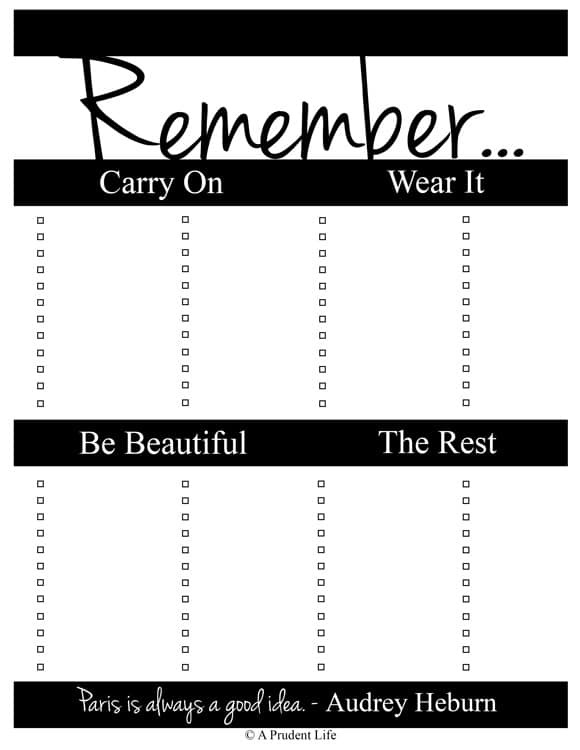 I’m using the 2nd column in “The Rest” section for my morning reminders. I love that I can now pack with confidence. I’m always interested to read Kim’s tips for packing light, because as you can tell, I bring half the house with me when I go! 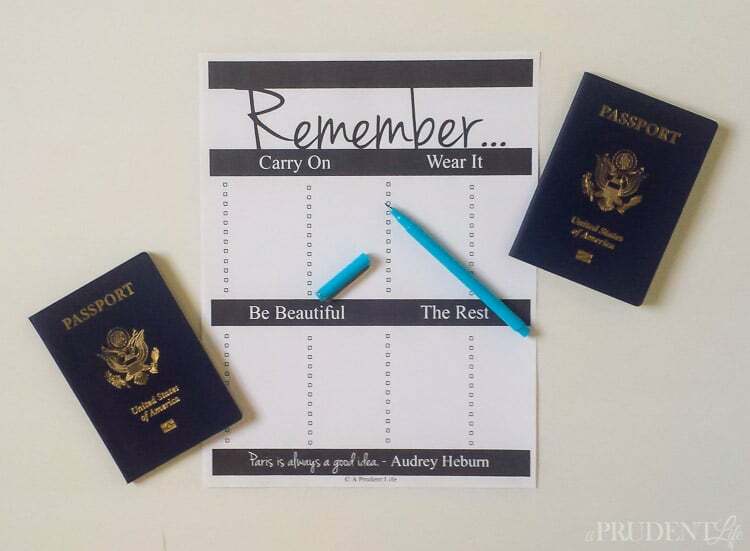 Click here to get your own printable packing list! It make take a moment to load completely. Thanks so much for reading today! If you’re interested in other ways I get organized, I’d love you to check out the 7 Things I Learned Organizing My Home. It’s all my best tips in one post!